I wanna say that this chapter wasn't as exciting as the previous ones, if only because I don't remember a whole lot about it aside from the term "stealth echolocation." 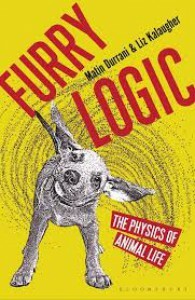 I admit, it could have also been my own issue that had my mind wandering while reading about sounds and vibrations. The peacock thing was pretty interesting as well, but only because the amusing emphasis on peacock mating made for a nice chuckle. And also, elephants are cool, what with their triangulation of sound to determine distance and direction. The chattiness of the authors' writing styles seems to have ebbed a bit... either that, or I've just gotten used to it enough that it doesn't bother me anymore. So this book is coming along quite nicely. The conflict between the physics working against the bat and its good hearing means there's a 'sweet spot' for ultrasound at a particular noise level where the bat's just near enough to echolocate the moth and the moth's just near enough to hear the bat. 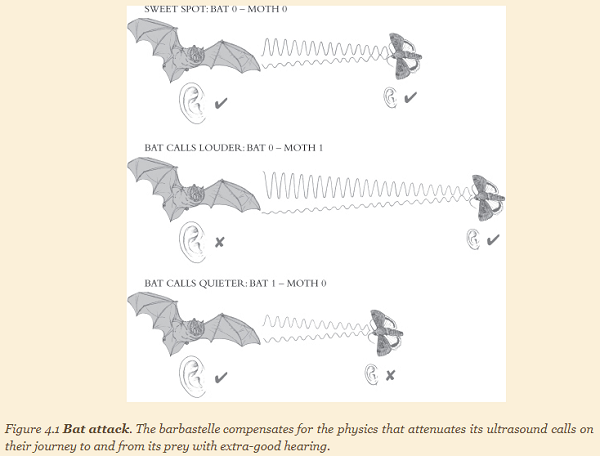 At this position the bat's better hearing exactly compensates for the echo it receives being weaker (because of the extra attenuation) than the sound going directly to the moth. Bat 0, Moth 0. If, however, the bat beams out ultrasound louder than this noise level, it's a 'moth win' as the moth hears the bat from further away, whilst the bat can't detect the echo, and the insect flies away. Bat 0, Moth 1. Only by beaming out ultrasound more faintly than this threshold can the sharp-eared barbastelle detect the eared moth without the moth hearing. Bat 1, Moth 0. The ultrasound pulse from the bat is quiet and the echo that bounces back is quieter still, but the bat sense it because its hearing is so good. The sound reaching the moth is louder, as it has only travelled one way. But, being a cloth-ears, the moth can't detect it. Unlucky, eared moth: you're dinner.